CauseVox is a verified Stripe partner and we recommend Stripe for donation processing for it's ease of use for donors and admins alike. Currencies Supported: USD, CAD, AUD, EUR, GBP, and any currency supported by Stripe. Donor Experience: Donors make a donation without leaving your fundraising site. Fund Disbursement: Automatic rolling 2-day deposit into your bank account. Credit Card Processor Fees: 2.9% + $0.30 per transaction *nonprofit pricing available, see below for details. You can contact their sales team if you have any questions about how Stripe can work for you. 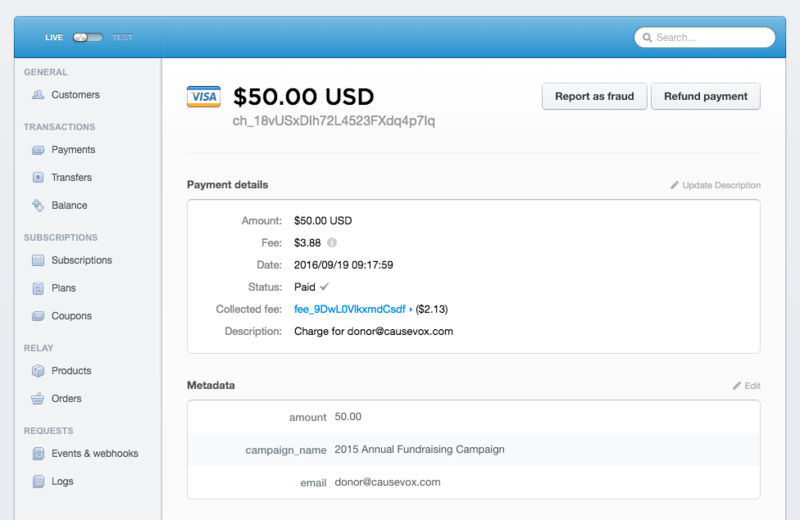 When donors click the donate button, they can enter in their credit card information on a secure form that is on your CauseVox fundraising site. The name of your organization or self is displayed on the donor’s credit card statement. CauseVox is not displayed. Funds are deposited directly into your bank account on a rolling 2 day schedule. What data is pumped into Stripe? With Stripe's webhooks, you can also set up notifications when donations come in with Slack, send this data to your CRM, and more. What currencies are supported through Stripe? USD, CAD, AUD, EUR, and GBP. More currencies available upon request. Please check Stripe for all currencies that can be processed. Stripe’s standard fees are 2.9% + $0.30 per donation. There are no sign-up or monthly fees on top of that. Stripe has also recently introduced nonprofit pricing for US nonprofits, in beta. Pricing for nonprofits is 2.2% + $0.30 per donation for non-American Express and 3.5% flat for American Express cards. You can contact Stripe at sales+nonprofit@stripe.com for additional information on how you can get started. How do I transfer funds from Stripe to my bank account? Donations through Stripe are automatically deposited via EFT into the bank account you specified in your Stripe account. You can view disbursement reports and deposit statuses on your Stripe account at www.stripe.com. If you have further questions on Stripe, please contact their support team at support@stripe.com. What is the Stripe’s donation process like for donors? 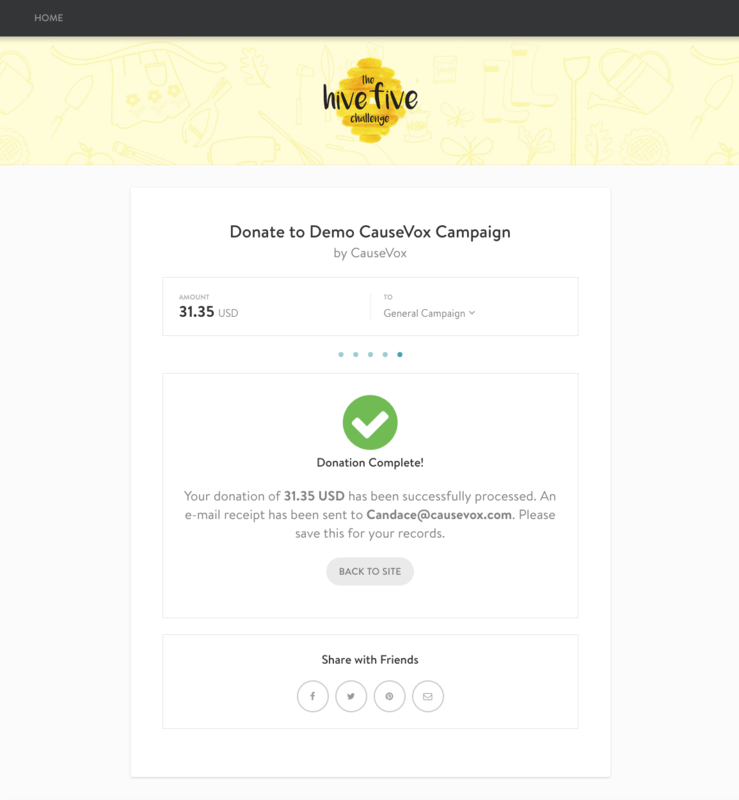 Step 5: Donors can input their credit card information directly on your CauseVox site without being redirected to another site, and click “Make A Payment” to complete their transaction. Step 6: After their donation, your donor has the opportunity to share your CauseVox campaign site via social media and email. 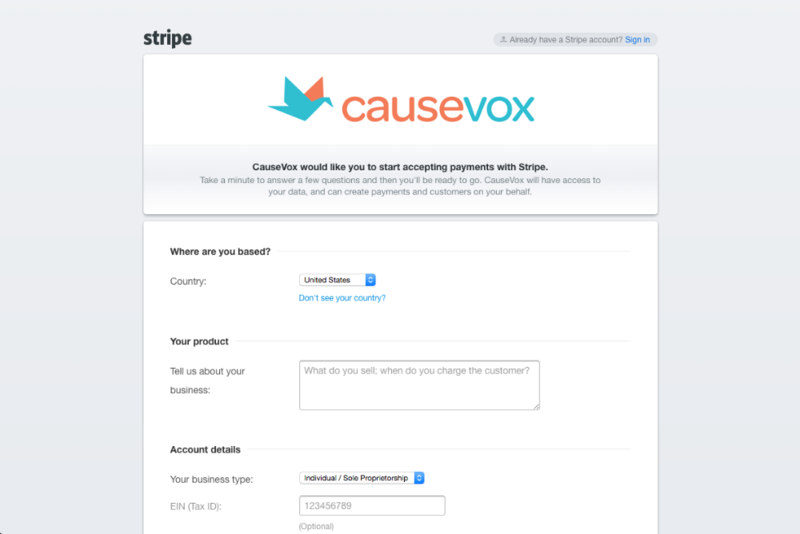 Setting up a Stripe account is easy and can be done directly in your CauseVox Admin Account. 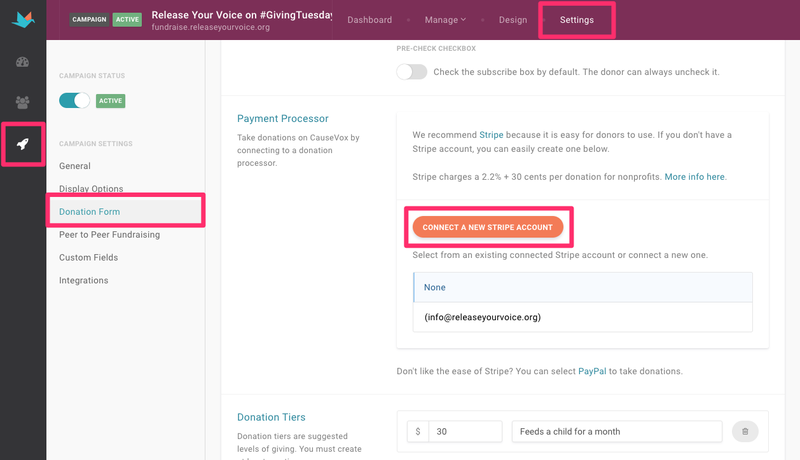 After you log into your CauseVox Admin Account, you can setup your Donation Processor with Stripe. You will find the Donation Processor section on the Site Settings page of your Admin Account. 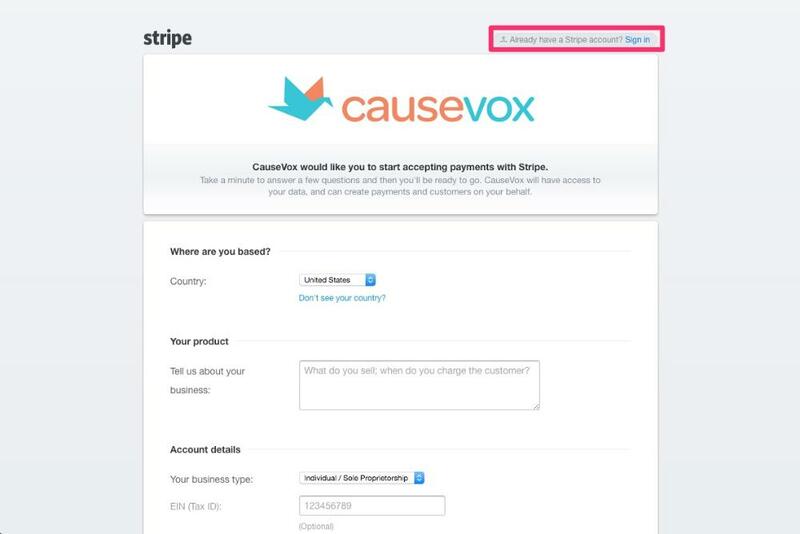 If you already have a Stripe account, you can sign into Stripe from your CauseVox Admin Account and your CauseVox site will immediately connect with your Stripe account. Once your form is complete, your newly created Stripe account is now already connected to your CauseVox campaign site. No additional steps needed! What Do Donations Look Like In Stripe? 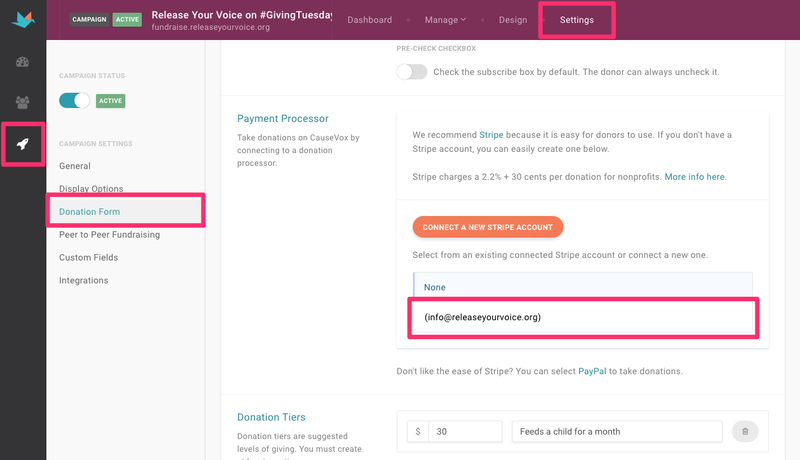 In Stripe, you'll see all the donations processed, with the amount, fee and collected fee (as per nonprofit pricing), date, status, campaign name, and donor email. You can manage your donations in your Stripe account and keep tabs on all your donations here. 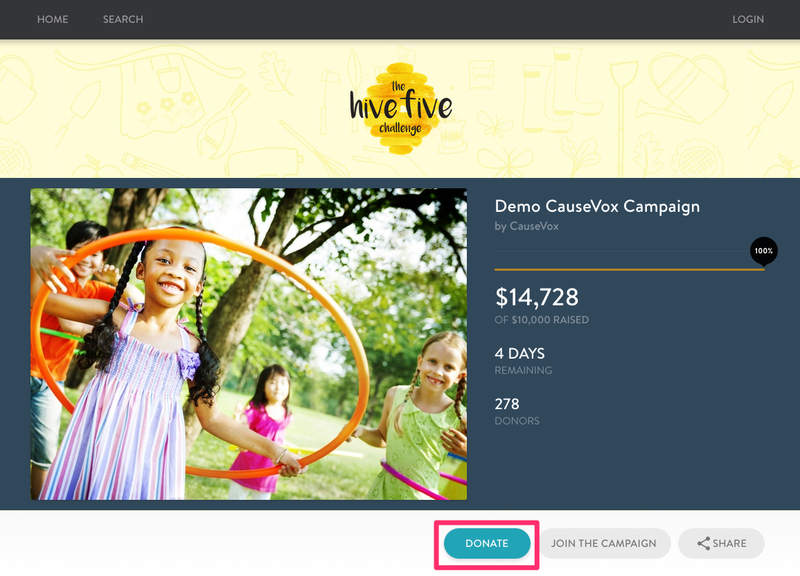 Step 1: In CauseVox, go to your Fundraising, select your campaign or donation page, and navigate to your Settings. Step 2: Select the Donation Form tab on the left menu. If you don't have a Stripe account connected or want to connect a new one, select "Connect A New Stripe Account." If you have a Stripe account already that you'd like to connect, you can just login with your account information. If you do not have a Stripe account, you can fill out their online form to create one in minutes. Once you complete the form, Stripe will automatically connect with CauseVox. If you already have a previous Stripe account connected to CauseVox, you can simply select the Stripe account from the listing and save.